The number of Jewish children in Jewish schools has almost doubled since the mid-1990s, rising from 16,700 then to over 30,000 now, while the number of Jewish schools has jumped from 62 to 139 over the same period. The report is the first in a series of studies being produced by the new partnership between the Board of Deputies of British Jews and the Institute for Jewish Policy Research, cooperating on the collection, analysis and publication of key community statistics. The results of the study show that the majority of the 30,900 Jewish children studying in Jewish schools in 2014/15 were in haredi schools (17,500, or 57%), whilst the remainder (13,400, or 43%) were in mainstream schools. Twenty years ago, the equivalent proportions were 45% strictly Orthodox, 55% mainstream. The shifting balance provides further evidence of the changing composition of the British Jewish community. The growth in the haredi sector is particularly striking. There are three times as many haredi schools in the UK today as there were twenty years ago, educating 10,000 more children between them. However, the overall increase in enrolment is not exclusively due to the growth of the haredi population. A significant part of the upsurge can also be explained by developments in the non-haredi or ‘mainstream’ sector. More than four out of ten mainstream Jewish school-age children are now studying in Jewish schools, compared with just a quarter twenty years ago. In numerical terms, that constitutes an increase of over 4,000 children. To accommodate this increase, there are 11 more Jewish schools operating in the mainstream sector than there were in the mid-1990s. Collectively, about 85% of all pupils studying in them are Jewish. 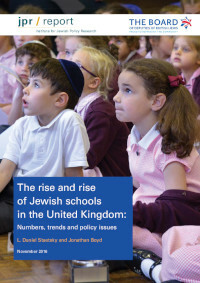 From a geographical perspective, Jewish pupil enrolment in mainstream schools in London and the surrounding areas has been growing steadily over the past twenty years, increasing by 72% since the mid-1990s. By contrast, Jewish pupil enrolment in mainstream Jewish schools outside of London has declined by 23% over the same period. In short, the mainstream Jewish school sector has become increasingly London-centric. The geographical dynamics are very different in the haredi sector. Whilst the majority of pupils in the strictly Orthodox sector are still attending schools in London, the number in Manchester has more than trebled over the past twenty years, and the city has increased its share of haredi pupils from one in five to one in four of the total. Thus, numbers in the haredi school sector reveal a shift towards Manchester.